^ Scheina, Naval History, 49–51; Grant, Rulers, Guns, and Money, 132–33. ^ The Arrival of the Nisshin and Kasuga. The Russo-Japanese War Fully Illustrated (Tokyo: Kinkodo Publishing Co. & Z. P. Maruya & Co.). April–July 1904, (1): 98–99. ^ Empire of Japan, Naval General Staff. Battle of the Yellow Sea: The Official Version of the Japanese General Staff. United States Naval Institute Proceedings (Annapolis, Maryland: United States Naval Institute). September–October 1914, 40 (5): 1289. ^ Ship Returned by Japan. Derby Daily Telegraph. 4 September 1911: 2 [9 March 2015] –通过British Newspaper Archive. .
^ Cruiser Arrives. The New York Times. 4 July 1920 [9 March 2015]. ^ Visit of the Kasuga. Panama Canal Record. : 16 [9 March 2015]. ^ Japanese Navymen. Aberdeen Journal. : 7 [9 March 2015] –通过British Newspaper Archive. .
^ Destruction of a Dirigible. Hartlepool Mail. 24 October 1928: 3 [9 March 2015] –通过British Newspaper Archive. .
^ Scientists Invade Island. Dundee Courier. 27 January 1934: 4 [9 March 2015] –通过British Newspaper Archive. .
坪谷善四郎編. 日露戦役海軍写真集. 第1輯. 博文会. 1905. 坪谷善四郎編. 日露戦役海軍写真集. 第2輯. 博文会. 1905. 坪谷善四郎編. 日露戦役海軍写真集. 第3輯. 博文会. 1905. 坪谷善四郎編. 日露戦役海軍写真集. 第4輯. 博文会. 1906. 海軍研究社編輯部 編. 日本軍艦集　2600年版. 海軍研究社. 1940. Campbell, N.J.M. The Battle of Tsu-Shima, Parts 1, 2 and 4. (编) Preston, Antony. Warship II. London: Conway Maritime Press. 1978: 46–49, 127–35, 258–65. ISBN 0-87021-976-6. Chesneau, Roger (编). Conway's All the World's Fighting Ships 1922–1946. Greenwich, UK: Conway Maritime Press. 1980. ISBN 0-85177-146-7. Chesneau, Roger & Kolesnik, Eugene M. (编). Conway's All the World's Fighting Ships 1860–1905. Greenwich: Conway Maritime Press. 1979. ISBN 0-8317-0302-4. Corbett, Julian Stafford. 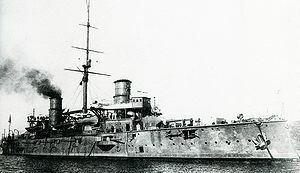 Maritime Operations in the Russo-Japanese War, 1904–1905. Annapolis, Maryland: Naval Institute Press. 1994. ISBN 1-55750-129-7. Evans, David & Peattie, Mark R. Kaigun: Strategy, Tactics, and Technology in the Imperial Japanese Navy, 1887–1941. Annapolis, Maryland: Naval Institute Press. 1997. ISBN 0-87021-192-7. Forczyk, Robert. Russian Battleship vs Japanese Battleship, Yellow Sea 1904–05. Botley, UK: Osprey. 2009. ISBN 978-1-84603-330-8. Gardiner, Robert & Gray, Randal (编). Conway's All the World's Fighting Ships: 1906–1921. Annapolis, Maryland: Naval Institute Press. 1984. ISBN 0-85177-245-5. Hirama, Yoichi. Japanese Naval Assistance and its Effect on Australian-Japanese Relations. (编) Phillips Payson O'Brien. The Anglo-Japanese Alliance, 1902–1922. London and New York: RoutledgeCurzon. 2004: 140–58. ISBN 0-415-32611-7. Jentschura, Hansgeorg; Jung, Dieter & Mickel, Peter. Warships of the Imperial Japanese Navy, 1869–1945. Annapolis, Maryland: United States Naval Institute. 1977. ISBN 0-87021-893-X. Kowner, Rotem. Historical Dictionary of the Russo-Japanese War. Historical Dictionaries of War, Revolution, and Civil Unrest 29. Lanham, Maryland: Scarecrow Press. 2006. ISBN 978-0-81084-927-3. Lacroix, Eric & Wells, Linton. Japanese Cruisers of the Pacific War. Annapolis, Maryland: Naval Institute Press. 1997. ISBN 0-87021-311-3. Milanovich, Kathrin. Armored Cruisers of the Imperial Japanese Navy. (编) Jordan, John. Warship 2014. London: Conway. 2014. ISBN 978-1-84486-236-8. Newbolt, Henry. Naval Operations. History of the Great War Based on Official Documents IV reprint of the 1928. Nashville, Tennessee: Battery Press. 1996. ISBN 0-89839-253-5. Silverstone, Paul H. Directory of the World's Capital Ships. New York: Hippocrene Books. 1984. ISBN 0-88254-979-0. Stewart, William. Admirals of the World: A Biographical Dictionary, 1500 to the Present. McFarland & Co. 2009. ISBN 0-7864-3809-6. Warner, Denis & Warner, Peggy. The Tide at Sunrise: A History of the Russo-Japanese War, 1904–1905 2nd. London: Frank Cass. 2002. ISBN 0-7146-5256-3. Great Britain, War Office: General Staff. The Russo-Japanese War Part I. London: His Majesty's Stationary Office. 1906.